Are you freaking out because of a leak in your ceiling? Considering how damaging such a leak can be to the interior of your home, your freaking is totally understandable. The leaking point is, in most case, meters away from the actual point where the water is entering the ceiling which makes investigating the source a very frustrating ordeal. Don’t lose hope just yet though as we are here to help you identify the source of- and fix- your ceiling leaking problem. Please be our guest. What Are the Common Causes of Ceiling Leaks? Leaks in the roof are the most probable sources of water which later leaks from the ceiling. That is, however, not to mean that you should rush to the roof every time you notice a water drop from your ceiling. There are several other probable leak sources that you ought to check out first before making your conclusions. Some of them include plumbing leaks and air conditioning leaks. How To Differentiate Between a Roof Leak And A Plumbing/An Air Conditioning Leak. There are only two ways to tell: observing the ceiling leak patterns or climbing to the attic and following the water trails to their source(s). 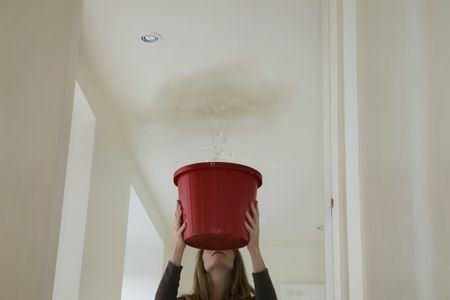 If, after observing the leak patterns, you realize that the water drops are dirty, there is a high chance that the leak is coming from the roof. The same probability applies to when the leaks come during or immediately after the rains and cease during the dry seasons. If, on the other hand, you notice a leak during a dry season, chances are that the leak source is from within the interiors and not the roof. Another characteristic of plumbing/air conditioning leaks is that their drops are mostly clean. Although observing the leaking patterns can give you a clue of what the leak source is, it’s always wise to access the attic and confirm the validity of that clue. Sometimes rainwater from a roof leak can pool in the ceiling and stay there for months, only for pests to scratch the ceiling and provide the water with an escape route. If that happens during a dry season, you might end up making the wrong conclusion that the water is from a plumbing line. If you saw some unexpected standing water or wetness in your home but didn’t see any water drop(s) falling from the ceiling, it is advisable not to conclude that there is a leak in the ceiling without first checking for water leaks within the home. You may need to check for leaks in the water heater, the washing machine, under water sinks, and any appliance that uses water. It’s only after confirming that none of those sources is leaking that you check the ceiling/attic. That being said, how do you locate the leak source from the attic? Locating Sources of a Ceiling Leak from the Attic. Always begin your leak investigations by measuring/approximating the distance between the leak and a fixed reference point in your living area. That could be a wall, a chimney, or a vent pipe for bathrooms. This distance will help you to easily locate the ceiling leak while in the attic; you will be on top of it at that time and locating it is definitely not the easiest thing to do. That done, take your flashlight, a plastic straw, and any other safety equipment that you might need while up there and, using a ladder, climb up to the attic. The flashlight will help you to locate where the ceiling leak is which will then help you to follow the water trail/stain from the leaking point to its source. If there is a water supply pipe at the end of the trail, check it to see if it could be the source of the leaking water. If it’s moist, you definitely have solved the puzzle. Repair it or call a professional plumbing company to do it for you. If it isn’t, check if there are any holes in the roof. The easiest way of detecting a hole in the roof is looking for light spots on the attic ceiling. If you see one, insert a straw to mark the hole so that you can easily locate it from the other side of the roof. • Spaces between sidings or shingles that could be causing the leak. • Any unsealed parts around the chimney, valley, or attic dormer vents. • Clogged gutters or any foreign material on the roof. • Any signs of tear and wear in all protrusions on the roof. If you identify the source, fix it using tar or any other roofing material. If you can’t, contact a professional plumbing or roofing company. A leak in the ceiling is arguably the most disturbing thing that can happen to a homeowner, particularly during wet seasons? Are you struggling with a ceiling leak in Knoxville, Tennessee? Have you identified the leak source but, for whichever reason, you are unable to fix it? Knoxville Plumbing is here to help. 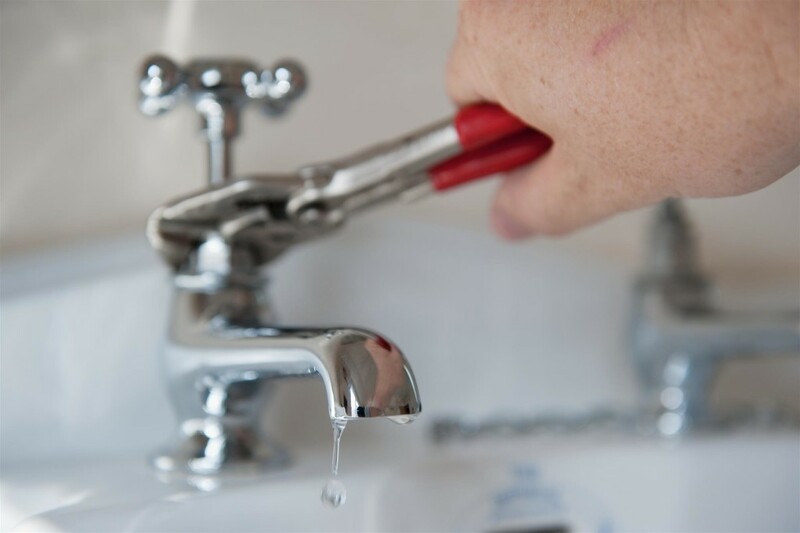 Our plumbers are experienced and dedicated to fixing all of your leaking problems. Give us a call. If you have determined it is a roofing leak call the best roofing company in Knoxville, TN. It’s oddly painful to hear the drip of a leaking faucet. The sound can drive anyone insane, but your water bills hurt your wallet the most when excess water leaks out of your faucet. You have the option to pay a plumber to fix all your needs! In the case that you can’t afford a plumber or you want to learn to do it yourself, we’ve brought you a guide on fixing one of the most common faucet types. We’ll be covering the others in later articles! 1. Turn off the water pipe that leads to your leaking faucet. You should look under your sink to find the handles, which are often along the pipes, to shut off the water. The next step is to twist them clockwise until they’re nicely tight. 2. Remember to plug your drain. If you have a plug or a rage, remember to use it on your drain. There is nothing more frustrating than having a screw, washer, or small item slip from your hand and fall down into those slimy depths. 3. Figure out what type of faucet you have. You’ll know the compression faucet easiest because it has two handles: one that turns on the hot water and one that turns on the cold water. If you don’t have a compression faucet, your sink has one handle that switches the water from hot to cold. If you can’t google the answer, this means an extra step where you have to take your faucet apart to understand what inner mechanism it’s using. There will be a ceramic cylinder in a ceramic-disk faucet. Like its name, the cartridge faucet has a cartridge. You might sport this faucet beforehand because they tend to come with decorative caps. You’ll have to remove the nut. The stem is on the O-ring, and the O-ring is on the seat washer. When you find the seat washer, check if the rubber is worn. This is generally why someone would have a leaky faucet. If your handles leak, the object you need to replace is the O-ring. You should be able to reassemble the handles now! You’ve fixed the minor leak. Having odor in the home isn’t just displeasing to your nose. The two main causes for the odor is mold and mildew accumulation that can be harmful to your health (allergy and asthma are two main conditions caused by undetected mold). This is not a problem that should be ignored, especially if you are trying to maintain the integrity of the home for years to come or are trying to sell it in the future. No matter how lovely the home is staged on higher levels, once your guests open the basement door and catch a whiff, they will know what the smell represents; Water! Mold and mildew smells coming from your basement are likely caused by condensation, leaking, and poor ventilation. Luckily, this problem can be remedied fairly easily. Check out these tips. The musty basement smell is strongest in spring and fall when utilities aren’t running and in the winter when windows are closed. Poor ventilation of the basement is how the smell permeates each square inch. The first thing you can do is buy a humidifier to remove moisture and dry the place out. Open all windows and doors in the vicinity of the basement in hopes it will tame the smell. Put on your home inspector hat because you are going to examine both the inside of the basement and outside the home around the perimeter of the foundation. Inside look for water spots that indicate leakage, cracks in the foundation, or actual mold. Look at exposed pipes to see if they are dripping or wet with condensation. These should be wrapped in a wrap product specifically made for the purpose. Note what you see and call a professional to make repairs immediately before severe damage is done to the foundation. The problems are likely from the outside where you will examine next. The land around the home should slope away so that rainwater is drained away from the home instead of down the foundation walls. Even water soaking into the dirt and penetrating the home’s concrete can cause cracks and damage. See if you have an adequate and clean gutter system doing its job. Gutter downspouts should extend at least 6 feet from the home’s foundation. To get rid of the smells long term you will need to apply several of these tips. Wear a mask as you use a water and bleach solution to spray and clean every surface of the basement to kill any harmful mold that has grown. The mold may not be visible but is still there so I would not skip this important step. If you have any closets or tight enclosed places in your basement, kitty litter makes a great odor eliminator in these areas. White vinegar scattered around in bowls will eliminate odor over a period of a few days. The smell of vinegar will also go away. For long term odor eliminating, leave open containers of baking soda in the basement just as you would for the fridge. The baking soda boxes can assist in odor elimination for up to 3 months. Is Your Home Natural Disaster Proof? As a homeowner, it is always important to be concerned with the integrity of your property. This is especially true if you live in a region that is more prone to natural disasters like floods, earthquakes and even something as common as a water main break. You never quite know what the unexpected might throw your way, so it is always important to know how ready your home is. It is time that you learned if your home is really ready to survive these natural disasters. You never quite know when a natural disaster could be heading your way, which means that you need to know how your home will be impacted. This is a type of natural disaster that s not quite as common as you might think. In most cases, your home will not have to withstand a very powerful earthquake. However, it is possible that an earthquake could occur in the region where you live. In most cases, the amount of shaking that occurs with a typical earthquake is minimal. This also means that the amount of damage that occurs as a result is not too extensive. Even though most earthquakes are small, there could come a time when earthquakes are larger and cause a lot more damage. When an earthquake occurs, it is a good idea to make sure that you turn off the gas. If a line ruptures due to the earthquake, it could cause a lot of damage to your home. This means that you should turn of the gas before this has the potential of occurring. Another natural disaster that you need to determine if your home can withstand is a flood. Flooding is common in certain areas and the amount of damage that occurs ranges depending on the amount of flooding that occurs. Floods can sometimes happen as the result of another natural disaster, which means that they have the potential to be twofold. You typically have warning when the risk of flooding is on the way, which means that you should take precautions like elevating all of the appliances in your home and putting sandbags into place on your property. There are always steps that you can take to make sure that your home is prepared for any natural disaster that may come your way. https://knoxvilleplumbing.com/wp-content/uploads/2016/04/Is-Your-Home-Natural-Disaster-Proof-2.jpg 1000 1500 user https://knoxvilleplumbing.com/wp-content/uploads/2016/03/Website-Logo-KNoxville-Plumbing-2.png user2016-04-12 14:55:452016-04-12 14:55:45Is Your Home Natural Disaster Proof? Gas leaks are a lot more common than you may actually realize. This means that if you own or rent a home, you are potentially at risk of a gas leak. This is something that you need to be aware of and it is important for you to know the top things that you should not do when a gas leaks exists. One of the best ways to be prepared is to know what actions are not suggested. If notice the strong smell of gas in your home, there are a few things that you need to make sure you do not do. One of the worst things that you can do when you notice the smell of gas in your home is to do nothing about it. Ignoring the smell of gas in your home is never a good idea. Gas leaks are incredibly dangerous and action needs to be taken right away. This means that by ignoring a potential gas leak, you could be putting your home at risk. You might assume that the odor is being caused by something else, but you need to make sure that you investigate the source of the gas smell and determine if you do in fact have a gas leak. It will not just go away on its own because the problem will only worsen with time. You might think that you have the capability of dealing with a gas leak on your own, but if you are not a professional in this field, this is not a good idea. You should never try to handle a gas leak on your own, because this is a situation that calls for experts. This means that you should only rely on professionals at the first sign of a gas leak in your home. It might cost you more money upfront, but it is the safer option in the long run and the best way to ensure that the gas leak will be fixed in the shortest amount of time possible. Trying to deal with a gas leak on your own is a mistake that you do not want to make. This will only cause you a lot of problems and is not worth the hassle. You are better off calling a professional right away.